Not only she impressed with her memorable roles on television, Ly Nha Ky also presented herself as a unmatched businesswoman and a great sense of style. In the latest luxury fashion photo shoot, Ly Nha Ky once again puts us in awe with her ever young beauty. 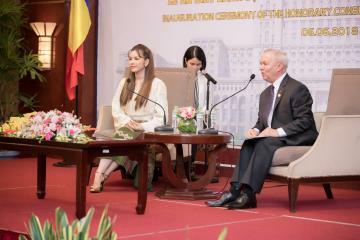 According to the official Appointment Letter from Romanian Foreign Affair Department, Ms. Tran Thi Thanh Nhan (Ly Nha Ky) will be serving as the Honorary Consul in a 4-year term starting on April 27th, 2018. Her outfit for the special event was an iteration of the traditional Romanian costume. Never a wrong outfit, this beauty is famous for her perfectly appropriate outfit at every event. 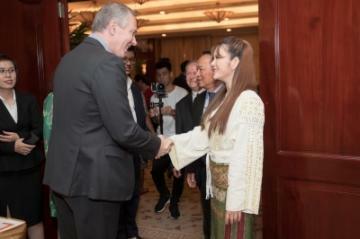 The talented actress will be promoting mutual growth in tourism and culture between the two countries. Please provide your email below. LYNK Services will send you with the latest updates and offers.